Bank Dole Lock No 1 is a minor waterways place minor waterways place place on the waterways major waterways place village town city on the Aire and Calder Navigation (Selby Section) between Bank Dole Junction (Junction of the Aire and Calder Navigation (Selby Section) and the Aire and Calder Navigation (Main Line)) (2¾ furlongs to the west) and Haddlesey Junction (Junction of River Aire and Selby Canal) (6 miles and 1½ furlongs and 1 lock to the east). The nearest place in the direction of Bank Dole Junction is Marsh Lane Footbridge; 1¾ furlongs away. 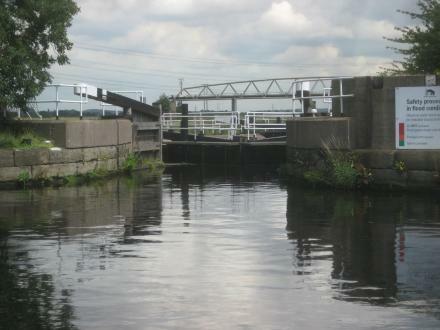 The nearest place in the direction of Haddlesey Junction is Bank Dole Lock Junction; ½ furlongs away. Dorning Street, Knottingley, WF11 8AH — 1287 yards to the west. 23 womersley road, Knottingley, WF11 0DB — 1047 yards to the southwest. 2 Spawd Bone Lane, Knottingley, WF11 — 1580 yards to the west. 36 Cow Lane, Knottingley, WF11 9BY — 827 yards to the west. Quarry house, 52b Womersley road, Knottingley, WF11 0DJ — 1223 yards to the southwest. womersley, Knottingley, WF11 0DH — 1277 yards to the southwest. middle lane, Knottingley, WF11 0BZ — 1280 yards to the southwest. Lamb Inn Road, Knottingley, WF11 8AU — 813 yards to the west. 18 Racca Green, Knottingley, WF118AT — 914 yards to the west. foundry lane, Knottingley, WF11 8AZ — 786 yards to the west. 23 racca green, Leeds, WF11 8AT — 885 yards to the west. Dewsbury — 1354 yards to the west. Weeland Road, Knottingley, WF11 8BE — 248 yards to the south. 94 womersley road, Knottingley, WF11 0DL — 1343 yards to the southwest. 5 Cow Lane, Leeds, WF11 0BY — 1312 yards to the west. 25 Womersley Road, Knottingley, WF11 0DB — 1048 yards to the southwest. 2 Eastfield Avenue, Leeds, WF11 0JW — 1584 yards to the southwest. Knottingley — 906 yards to the south. 88 Weeland Road, Leeds, WF11 8 — 943 yards to the west. Aire Street, Knottingley, WF11 9AT — 1230 yards to the west. Alfred House, Ropewalk, Knottingley, WF11 9AL — 1058 yards to the west. 54 The Poplars, Knottingley, WF11 0DE — 1398 yards to the southwest. Harker House, Common Lane, Knottingley, WF11 8BN — 566 yards to the southwest. Leeds — 1277 yards to the southwest. Knottingley — 562 yards to the west. Knottingley, WF11 8 — 1483 yards to the east. Ropewalk, Knottingley, WF11 — 1163 yards to the west. Sunny Bank, Leeds, WF11 9DA — 842 yards to the west. 5a foundry business centre, Knottingley, WF11 8AZ — 795 yards to the west. Downland Crescent, Knottingley, WF11 0EH — 1421 yards to the southwest. Knottingley — 1329 yards to the southwest. Weeland Road, Knottingley, WF11 8AP — 248 yards to the south. 55 Weeland Road, Knottingley, WF11 8BE — 840 yards to the west. Middle Lane, Knottingley, WF11 0BZ — 1241 yards to the west. Unit 8, fernley green industrial estate, Knottingley, WF11 8DH — 442 yards to the west. Knottingley — 813 yards to the west. Leeds — 1294 yards to the southwest. England Lane, Knottingley, WF11 0JA — 1526 yards to the southwest. Knottingley, WF119BJ — 664 yards to the northwest. Marsh Lane, Knottingley, WF119 — 566 yards to the west. Wakefield — 1277 yards to the southwest. Headlands Lane, Knottingley, WF11 9DG — 1292 yards to the west. 1293 yards to the west. 556 yards to the southwest.